Spotted by many watching on TV. 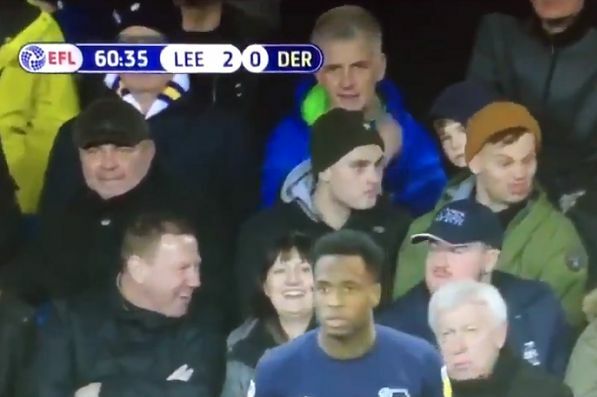 A Leeds United fan made funny faces behind the subs board during his side’s 2-0 Championship win over Derby County at Elland Road on Friday night. Marcelo Bielsa’s side led 2-0 thanks to goals from Kemar Roofe and Jack Harrison when Frank Lampard’s Rams decided to make a substitution on the hour mark. As they brought on Florian Jozefzoon for George Evans, a Leeds supporter in the stands pulled comedic facial expressions and was spotted by many back home. The match was screened live on Sky Sports, granting the fan’s antics widespread exposure. Leeds are now five points clear at the top of the table, although they have played a game more than 2nd placed Norwich City. Derby meanwhile lie in 6th under former Chelsea and England midfielder Lampard, four points ahead of Nottingham Forest.